Hello, mesdames et messieurs! What an absolute delight to have this opportunity to speak to you! My lovely wife Priscilla and I have leased the space beside the charming boutique, The Seven-Year Stitch. Isn't that a scrumptious name for an embroidery shop? And have you met Marcy Singer, the proprietress of said shop? She, too, is scrumptious. Please forgive my digression. As I was saying, Priscilla and I will be leasing the space for our Horror Emporium during the month of October. What is a Horror Emporium, you ask? Well, some might refer to it as a haunted house. But I prefer to think of the Horror Emporium as a more sophisticated spectacle, a more riveting experience than one would have at a typical All Hallows' Eve scream-fest. Priscilla and I are especially interested in getting Marcy's impression of the Horror Emporium. Her mother Beverly is a Hollywood costumer, you know...one of the best in the business, in our opinion. We feel that if we can thrill Marcy--she who grew up exposed to some of Hollywood's most fantastic special effects--then we can be satisfied that we've done an incredible job. Wouldn't you agree? Excuse me? Ah, yes, my attire. Fair Priscilla and I prefer extravagant dress. Clothes make the man and the woman, do they not? And my top hat and tails make me feel genteel and courtly as I walk the streets of Tallulah Falls greeting fellow citizens and inviting them to visit the Horror Emporium. I must admit, however, that some people don't seem to approve of our stylish habiliments. I've heard a rumor that one of Tallulah Falls' shopkeepers--Nellie Davis, of the aromatherapy shop--feels that Priscilla and I are from another era. That, my good people, I take as a compliment. The part of the rumor to which I must take exception is that the gentlewoman believes my dear wife and me to be vampires. Have you ever heard anything so ridiculous? What say you? How much do people's garments influence your impressions of them? 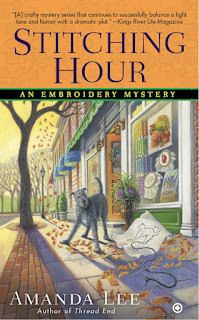 Click the link for more information about The Stitching Hour, coming November 3! How you wear your clothing definitely has an effect on how people perceive you. Just look at how slovenly today's teens are with their pants belted around their knees and their undershorts showing to the world.